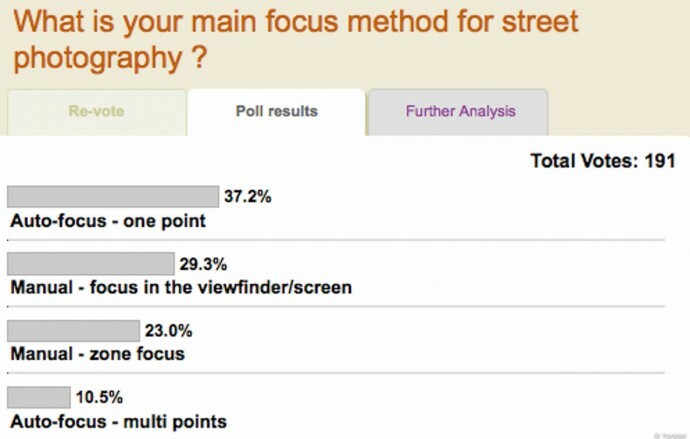 Weekly poll #3 : What is your main focus method for street photography ? Leica M9 with 50mm Summicron at F2.0, 1/750, ISO160 – I zone focused to get this shot and it does show the challenges to do so wide open. Coming back to last week's poll (which is your main camera to shoot street photography), rangefinders seem to be a street photographers' favorite since it gathered about 40% of the votes (well, there is a small Leica bias on this website). M4/3 came in second with 25% of the votes, while surprisingly reflexes only got 20% of the votes. Finally, though all you hear lately is about Instagram, only 4% of respondents use a phone as main street camera. I shoot with a 35mm. So it's easy to zone-focus, even with a full frame camera. When I'm walking, my camera has always this setting : F11 / focus 2M, which allows to be ready. It's only when I want a particular depth of field that I play with aperture and change focus. Of course, with a M, the focus is manual. But even with my X100, I used to work in a same way (because autofocus is too slow and not reliable in weak light). You must be using a high ISO then ? Otherwise how do you manage when you get into shadows ? I was doing f16, A priority @ about 1.5m. Recently Im f5.6 @ just under 1.5m, 1/500th (or so) with auto ISO as Ive got more confident with distances. What I don’t like about Auto-ISO is the risk to blow up the high lights. It is too big in my opinion that is why I only use it with the X1 is special conditions. From the previous week's poll, where do you put the X100 ? I picked "mirrorless" but definitely not a m4/3"
Good question which I should have better explained. To me, it is a mirrorless camera, justl like the Leica X1. What you see in the viewfinder is does not go through a mirror. That's a lot of people with rangefinders. What was the total number of votes? 225 voters. I run the polls for a week than close them. It can be a theme, but usually you lose some candidness when people spot you. And any series which is too restricted in subjects soon can becoming boring to the viewer. I like to throw a few street portraits within a series/book, but not that purely.